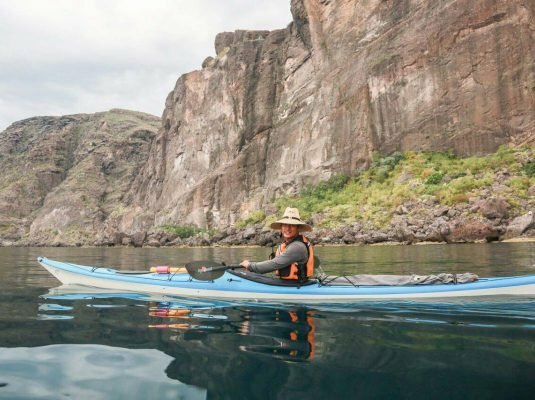 Our favorite long-distance adventure, the La Paz Route takes 10 days for a group of experienced paddlers to complete. The seas and coastline provide the perfect environment for relaxing and exploring. 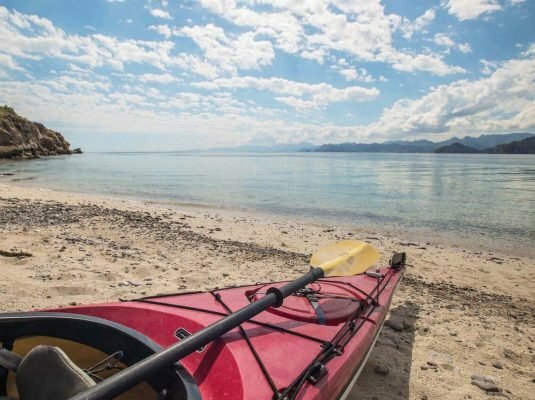 If you’ve tried our Coasts & Islands trip and want to see more, or if you’re an avid kayaker who wants to experience as much of the Baja California coast as you can, this is the expedition for you. You’ll be met at the Loreto airport by one of our representatives and be taken to a hotel in town. An afternoon orientation will help you become familiar with the trip, and you have the rest of the evening to explore the historic cobbled streets of Loreto. Your guides host a buffet breakfast before a 3-hour drive to the put-in at Agua Verde. We can store any gear you leave behind. 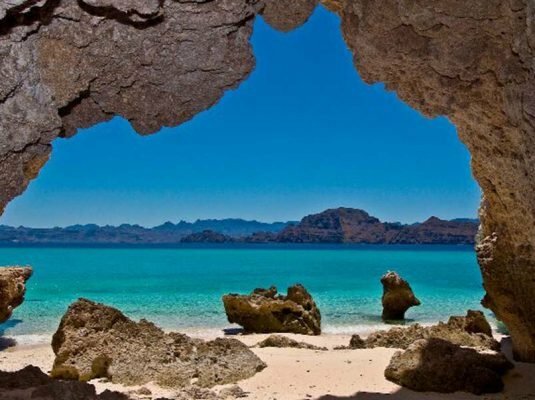 If you are scheduled to fly out of La Paz, we can deliver it to you at the end of the trip. 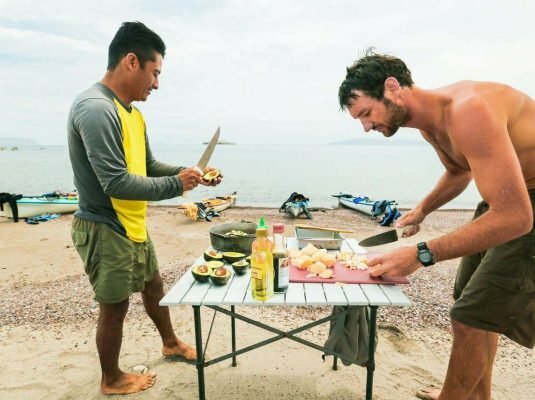 At the put-in, we’ll pack our kayaks, review basic paddling and safety instruction, and hit the water toward our first camp, the Rancho Santa Marta. Once the seat of the prolific Higuera family, the ranch is now run by old friends who will host us for the night. Another leisurely day will include a lunchtime stop for some snorkeling, followed by us making camp at Puerto Gato, a cove with turquoise water and beautiful rounded red rock formations rising above the beach. Feel free to hike and explore the surrounding area. The Sierra Giganta mountain range can be seen in the distance for most of the trip, but as we move south they will pull away from the coast for a while. Today takes us past the historic village of Tembabiche, built above the sand dunes in the early 19th century by the De La Toba family, who financed the construction with money from a famous pearl. If conditions permit, we camp at a site from an even earlier time, with indigenous artifacts all over the area. A short paddling day should take us to Los Dolores Ranch by mid-morning. We generally plan a one-day layover here to rest and enjoy everything this historic area has to offer. For the layover day, you can relax by the beach and join us on whatever activities interest you. Get out the snorkeling gear and witness the Sea of Cortez’s abundant marine life. Hike from the 150-year-old adobe ranch to the 300-year-old Mission Los Dolores, stopping to admire the towering mango trees and the freshwater canal system which has fed them for centuries. Your guides know a great deal about the history behind the mission and the first settlers to the area, and can show how nearby natural waterways helped them survive in their desert surroundings. 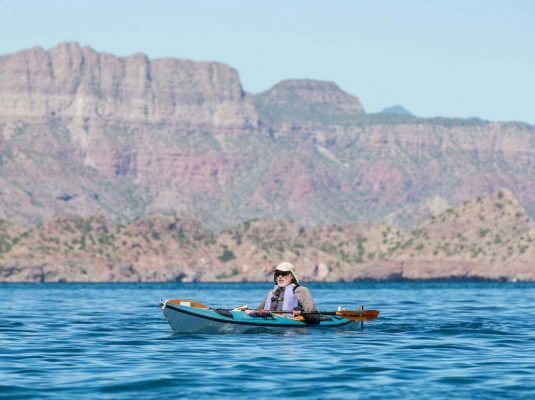 Today we paddle between the mainland and the Isla San Jose, where large cliffs shoot out of the sea on either side, as agave cactus and wild fig trees struggle to grow on the sheer rock. Friends await us at Punta Alta: Doña Cuca and Don Chuy León, whose fishing family provides hospitality during a rest break. The Sierra Gigantas are back near the coast, and around our campsite is one of the most astonishing examples of the area’s geological beauty. You’ll have spent a full week paddling along a pristine, roadless coast at this point, so the appearance of San Evaristo, a small fishing village, with its yachts and handful of buildings, may feel like a return to civilization. But once we’ve paddled several hours to the campsite, the distant lights of La Paz will be our only reminder that the outside world exists. 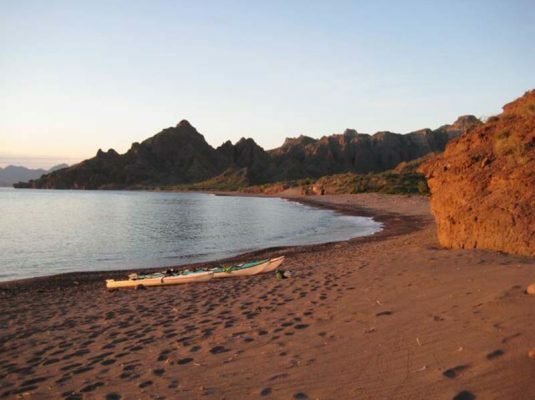 Rounding Punta El Mechudo, you’ll paddle by green copper-laden cliffs, camping at a beautiful cove. The deep underwater canyons and colorful gorgonian sea fans make for some of the trip’s best snorkeling sights. As we enter the curve of La Paz Bay, it’s common to see mantas, dolphins, and even whales when the bay begins to open up. An equipment truck will meet us there to take our gear to a hotel. You can shower, explore the city, and then we will meet at a restaurant in the evening for an end-of-trip dinner. Your guides can help you arrange transportation so you show up at the airport on time. If you need to leave early to make a flight, you can leave right away. If you leave later, you can take some more time to explore La Paz before saying adios.